(Nanowerk News) A residential module fully constructed from reusable, recyclable, and compostable materials: This is the premise for the newest unit in NEST, the modular research and innovation building run by Empa and Eawag in Dübendorf. On 8 February 2018, the NEST “Urban Mining & Recycling” unit will open its doors and henceforth house two students. At the same time, as an active lab it will also help to advance the construction industry's transition to a recycling economy. A growing scarcity of resources, along with the resulting desire to move away from today's throwaway mentality, means that the building sector must give more thought to the multiple use and recyclability of materials, as well as to alternative methods of construction. The newest NEST unit called “Urban Mining & Recycling” implements these ideas; the result is a residential module featuring structures and materials that can be fully reused, repurposed, recycled, or composted, following deconstruction of the module. The concept was devised by Werner Sobek with Dirk E. Hebel and Felix Heisel. Werner Sobek is Director of the Institute for Lightweight Structures and Conceptual Design at the University of Stuttgart and founder of the Werner Sobek Group. Dirk E. Hebel is the Director and Felix Heisel is the Head of Research at the Chair of Sustainable Construction at KIT Karlsruhe and the Future Cities Laboratory at the Singapore-ETH Center. "The ongoing, sustained growth of the global population as well as dwindling resources urgently require us to do some rethinking in the construction industry", says Werner Sobek. "In future, we must reduce our consumption of construction materials and build for many more people." The concept of cycles must, therefore, play a central role on the path to more sustainable construction: "The materials that we utilize will not just be used and then disposed of; instead they will be extracted from their cycle and later returned to it", says Dirk E. Hebel in explaining the concept. Thus, a wide variety of serially processed components are used in the “Urban Mining & Recycling” unit; the various materials can be separated, sorted and, without any residues, returned to their respective material cycles. Among other things, the unit uses new insulation boards made from mushroom mycelium, innovative recycling stones, recycled insulation materials, and leased carpeting. The structure and large parts of the facade are made of untreated wood. "The innovation here lies in the joinings", explains Felix Heisel from KIT. "All joinings can be easily reversed because, for instance, the materials are not glued together but rather tucked, folded, or screwed." The used wood is also applied in such a way that an otherwise standard chemical coating is not necessary anymore, thus making purely type-sorted recycling or purely biological composting feasible. In addition to the wood, the edging of the facade is made of repurposed copper sheets that previously covered the roof of a hotel in Austria and sheets that have been manufactured from melted down, recycled copper. The entire unit was prefabricated and installed in the research building on the Empa campus in Dübendorf in just one day. Soon, two students will move into the three-room apartment and regularly discuss their everyday experiences with the researchers involved. "By implementing and demonstrating the systematic cycle concept in a real-world building project, we of course hope that we can trigger a change in thinking in the construction world", says Enrico Marchesi, Innovation Manager at NEST. "In future, buildings should not only offer residential and work spaces, but also simultaneously serve as material repositories for the next generation." In the construction and energy sector, launching new products and technology on the market quickly is easier said than done. Nowadays, there is often a sizeable gulf between technology that works in the lab and the market, which demands reliable, well-engineered products. NEST (Next Evolution in Sustainable Building Technologies) expedites the innovation process by providing a platform where new developments can be validated, tweaked and demonstrated under realistic conditions. 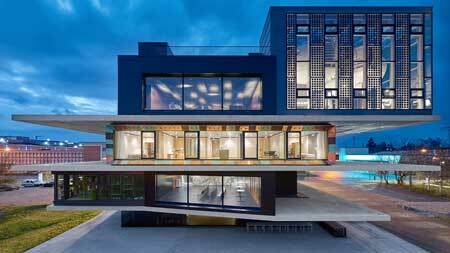 The modular research and innovation building of Empa and Eawag consists of a central “backbone” and three open platforms, where individual research and innovation modules can be installed based on the “plug-and-play” principle. People live and work in these units, which double up as bustling experimental laboratories. National and international research teams from universities, architectural firms and innovative companies from the building industry join forces in NEST. Together, research, industry and the public sector are paving the way for the future of the construction and energy sector.